I wish I could know where we are headed. Oh, for a time machine, this time to peek forward instead of backward. But I cannot know, the best I can do is care, and work. While we’re doing all of that caring and working, we’ll need our quiet pauses, too… and we’ll need our tiki bars. I’m already seeing folks headed to tiki bars to ease their rattled nerves, and vocally cherishing the temporary escapism they provide. In Tiki, we know world building. I’m still doing the work of supporting artificial world building here at Critiki, but I’m also going to be focusing my time and effort on real-world building. You’re not likely to hear much about it here, because that’s not what Critiki is about. But know: this is an escape; reality lies at the end of that path, and that needs our attention, too. And oh, hey! 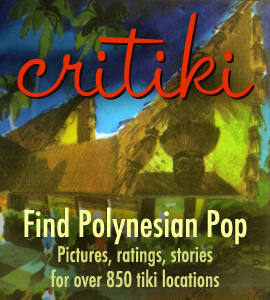 Critiki now has over 900 tiki locations! Today’s new feature: you can now see the latest activity across Critiki. It includes the latest new location listings and Critiki News articles I’ve written, and from Critiki’s members, the latest new comments, new pictures, and new upcoming visits. You’ll see the most recent of each of these on the home page, and a new Latest Activity page lets you see much more.